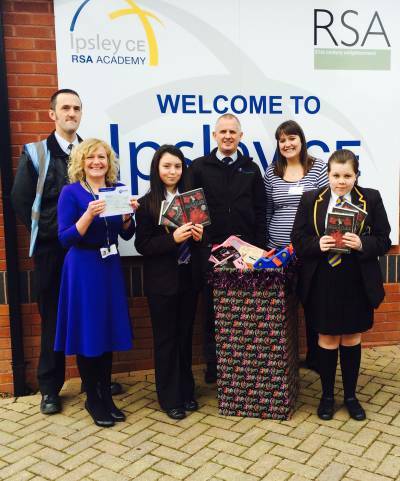 A local middle school, Ipsley CE RSA Academy, has been selected by Redditch-based charity The Oakland Foundation to receive educational and financial support for its pupils for the coming year. Oakland Foundation Trustee, Hayley Smith, explained: “The Foundation was officially introduced to Ipsley School last year when we agreed to donate over £1,000 to help purchase new reading books and pay for educational subscriptions. “We now have agreement from our main sponsor Oakland International that every employee can volunteer for up to 4 hours each year to support teaching programmes, with a further agreement that this can be extended if employees match hours from their own time, which is fantastic news for the school and for the work of the Foundation going forward.” added Hayley. The Foundation has also supported the school’s Eco Club with a visit to Oakland International’s head office, organised a donation of children’s toys for the schools friendship club, and with the support of its sponsors, donated scrummy pancakes for the pupils’ Shrove Tuesday lunch. The Oakland Foundation aims to relieve the needs of children living in Redditch and Bromsgrove and the surrounding area who are in need by reason of their financial hardship or other disadvantage. Offering support in areas such as Health and Nutrition, Education and Sport, the Foundation was officially opened by Her Royal Highness The Princess Royal in June of 2013. Ipsley School Headteacher, Mrs Hammond, said: “This new partnership with the Oakland Foundation has already had significant impact in supporting our pupils with their learning. We have been able to purchase a number of readers to support our English curriculum and on behalf of our pupils we thank Oakland for this. Oakland has committed a significant number of hours which will enable us to move forward on a number of exciting enrichment activities for our pupils in the coming year.” Working closely with the Redditch Food Bank, the Foundation also provides sponsorship for youth organisations via team kit sponsorship as they have done for the Redditch YMCA Disability Football Team and Feckenham Village FC. Sponsorship of South Bromsgrove School’s Spelling Bee, as well as supporting and working with students involved in the Young Enterprise Award Scheme.